The Best Way to Experience the Mobile-Tensaw River Delta! Airboat Adventures is More Than a Boat Ride! Are you looking for an adventure of a lifetime? Take an Adventure Ride with Airboat Adventures in the Mobile-Tensaw River Delta. 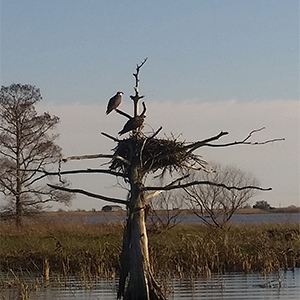 This Delta is home to a very dynamic ecosystem of alligators, egrets, turtles, snakes, herons, hawks, owls, eagles and more. You’ll have a very unique experience and never know what you might see. Bring the kids, your family, and closest friends! Come and see how beautiful and unique the Mobile-Tensaw River Delta really is. Book your Adventure Ride today and we will meet you at The Blue Gill! 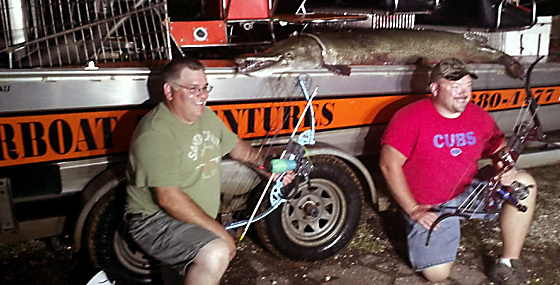 We bowfish on custom airboats! Airboat fishing best method because there is no underwater exhaust or propeller! 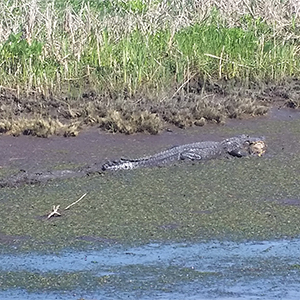 We’ll slide along down the Mobile-Tensaw River Delta calmly so you can sneak up on the big ones! Our airboats with brand new led lights to provide you a clear view of the water for your perfect shot. Our trips are all inclusive. We provide high quality compound bows with reels. We’ll even teach you how to use them! 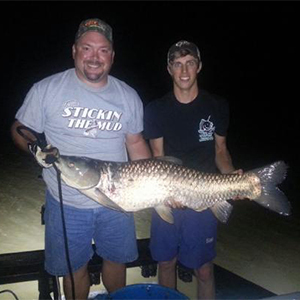 Our saltwater bowfishing includes sheephead, flounder, mullet, black drum, sand brim and stingrays. 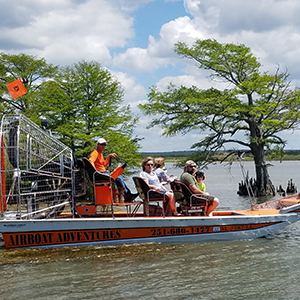 Experience the Mobile-Tensaw River Delta with Airboat Adventures enjoy getting up close to nature. Our airboats are built by Diamond Back one of the finest airboats made powered by a 496 cubic in. marine engine. This airboat will get you up close to the shallow water animals. The Mobile-Tensaw River Delta is home to some of the most unique and rare creatures you will ever see. It has hundreds of acres of threatened and endangered species like the black bear, American alligator, and Alabama red bellied turtle. Our locals and out of town visitors get great benefit riding with retired Department of Conservation State Parks and Manager of the Meaher State Park, Mark Pillion. 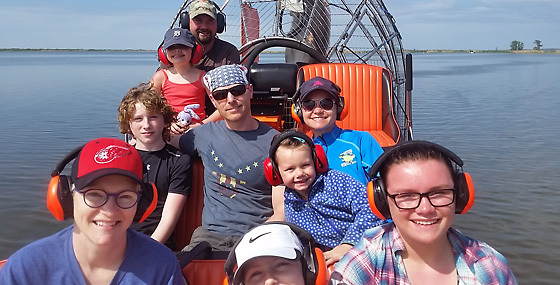 Mark’s 26 years of experience right on this very delta and as a certified US Coast Guard Captain will take your Airboat Adventures to a whole new level. So come take an adventure with us at Airboat Adventures. 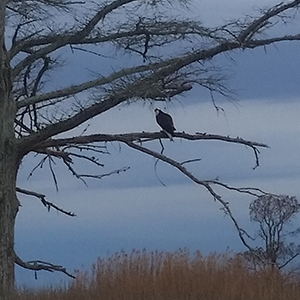 The Mobile-Tensaw River Delta is home to alligators, egrets, turtles, snakes, herons, hawks, owls, eagles and much more. The cypress-gum swamp and tidal brackish water marshes makes the Mobile-Tensaw River Delta one of the most unique watersheds in the world. With one side of the causeway being fresh water and the other side being salt water, the only other place you will see that is on the other side of the world. If you are a geography nut, you will enjoy seeing the Mesic food plains. 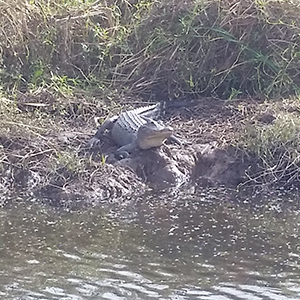 You’ll never know what you might see on your airboat adventure! We are located at the Blue Gill Restaurant right off the causeway between Mobile and Spanish Fort, Al. We can customize any ride to meet your needs! 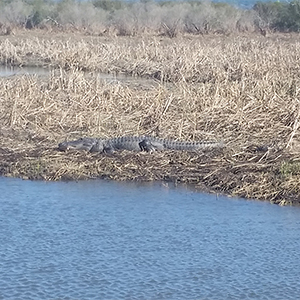 Fun is what you will have, running the shallows in an airboat looking for all the native wildlife. Fun for the whole family! 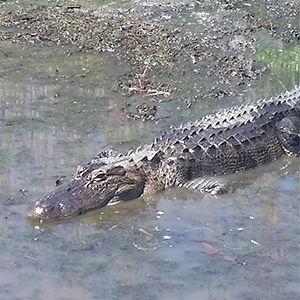 This is the time to see alligators and lots of them from 6" up to 12'. We may also see some shore birds and plenty of fish. This is more of and educational slow rides with stops to take photographs and ask questions about the Delta.